Did you ever wonder how horse training was done thousands of years ago? I often wondered about how horses were treated, housed and cared for. They were after all the main source of transport and farm power. I figured they had to have extensive training for battle too. I came across an interesting site that has a book all about that. It mainly talks about how Arabian horses were trained but I bet those techniques were used in other parts of the world. 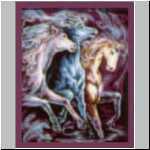 How the ancients trained their horses, click here to see the book Well that link no longer works. I do know that there are a few ebooks online that show horse training in the 1800’s but the methods are harsh if not down right cruel. Here is the link to the text books. You will have to do a search in the search box, but you will find tons of stuff.